I may be a vegetarian, but for witches’ fingers recipes I make an exception. Luckily for me, real witches’ fingers are a little difficult to obtain, so I have to go with a meat substitute. Vegetarians, man. Sorry, I’m being gross. But hey – if I can’t be gross at Halloween time, when can I be gross?! 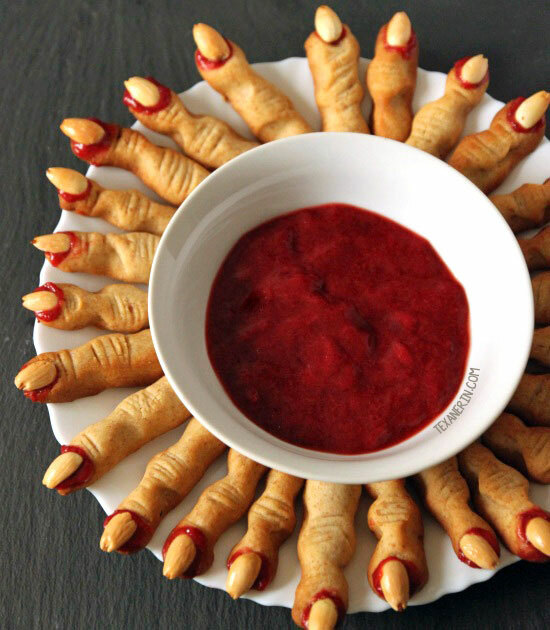 Speaking of gross, I’ve got a fun little round-up for y’all today – you guessed it, it’s all about my favorite Halloween appetizer, witches’ fingers! 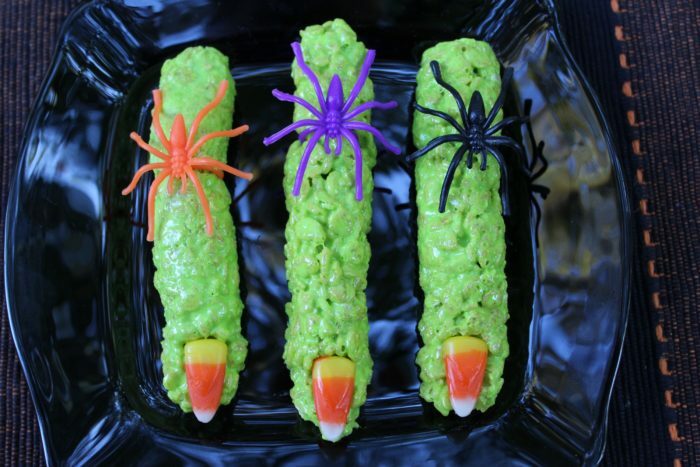 There are several ways to do them – witch finger cookies, breadsticks, candy – even rice crispie treats! And here, I’ve rounded up 10 of my favorites – the perfect number to count on both hands. I’ve definitely moved more toward homemade fare as the years have passed, but you know what? I make these breadsticks every Halloween. And I always use refrigerated breadstick dough or pizza dough (helloooo Trader Joe’s). Halloween time is a busy time, and so I’m all about the easy. Sometimes I use sliced almonds for the fingernails, sometimes I use bell peppers and with a bit of cream cheese for “glue.” The second version comes in handy for nut-free environments like preschool. 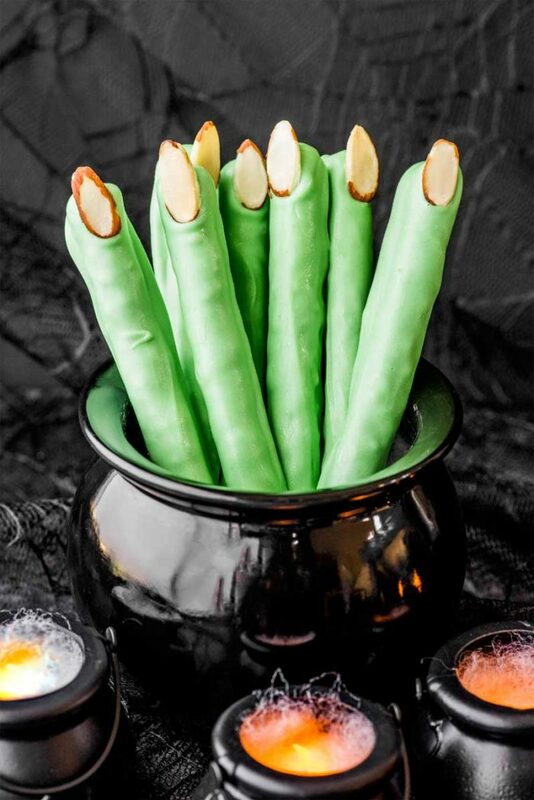 If you want to take breadsticks straight to sandwichville, Pillsbury has you covered with these witches finger sandwiches. I swear, sliced almonds make the best gnarly, messed up, in-desperate-need-of-a-manicure fingernails. 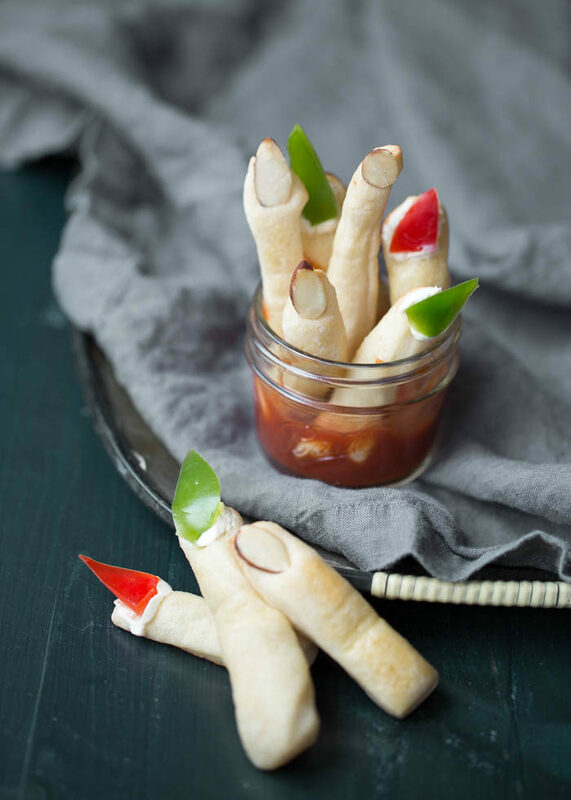 Another case in point: These Witch Finger Pretzels from Chrisy at Homemade Hooplah. Simply made with pretzel rods, candy coating, and almonds, I’ve got to give this blogger a hand. Ha. Hand?! Sorry. For these next couple of examples, we’ve got gnarly sliced almonds with bloody cuticles. So gross! So awesome! Some folks use red gel food coloring for the blood, but here we have raspberry jam for seriously delicious digits. First up: Whole Wheat Witch Finger Cookies with Raspberry Jam from Texanerin Baking. Love the blanched almond fingernail action. 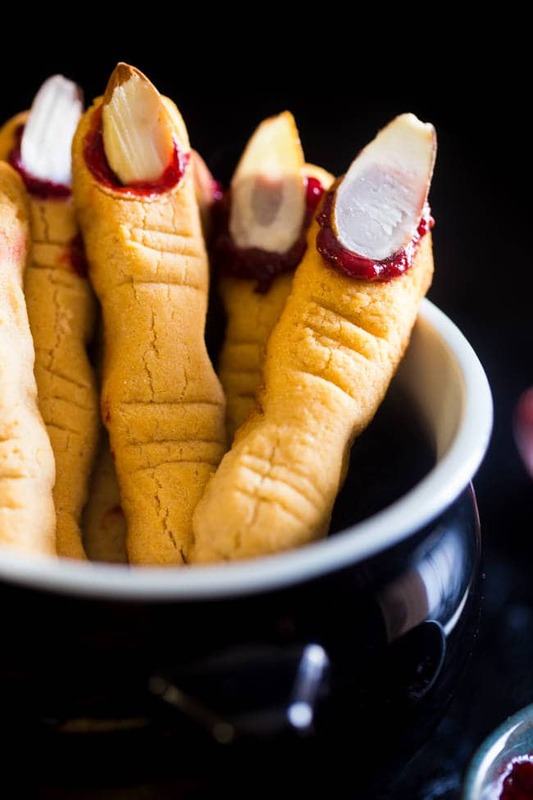 And look at these Witch Finger Cookies from Food, Faith, Fitness. Paleo, gluten-free, vegan … they’re sure to work for everyone no matter, er, witch diet they’re on. Snap, cackle, pop! These green rice crispie fingers with candy corn nails are so colorful and inspired; I think they would be my kid’s favorite, hands down. SERIOUSLY, SOMEBODY STOP ME WITH THE FINGER PUNS. Another candy-coated pretzel rod that I love is this white-chocolate and pepita version from Good Housekeeping. Perfect! Oh, and for the easiest fingers of all? Check out this one with circus peanuts and jelly beans. Nailed it! 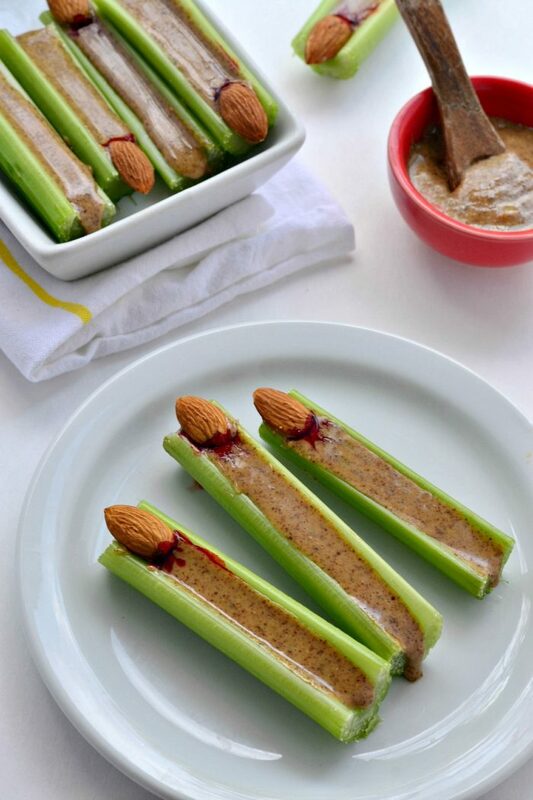 The ever-clever Cara from Fork and Beans makes a healthy witch finger snack with celery, almond butter, and almonds – no sugar in sight, just creepiness. Celery not your thing? Here’s a carrot version. The better for seeing, my dear. I know I said I’d have only 10 ideas, but here’s #11, a bonus: Have you heard of witches’ fingers grapes? These little pretties are creeeeepy! Yet tasty and pretty much pure awesome. Inspired but tired? Pin this image right here for next year!